It has been a harrowing week for retail’s once shining star Ted Baker and a trading update today did little to reassure fretting investors. The fashion firm’s shares have tumbled 23 per cent to a five-year low after claims of harassment levelled at its boss Ray Kelvin came to light in the form of a petition against his ‘hugging’ culture. 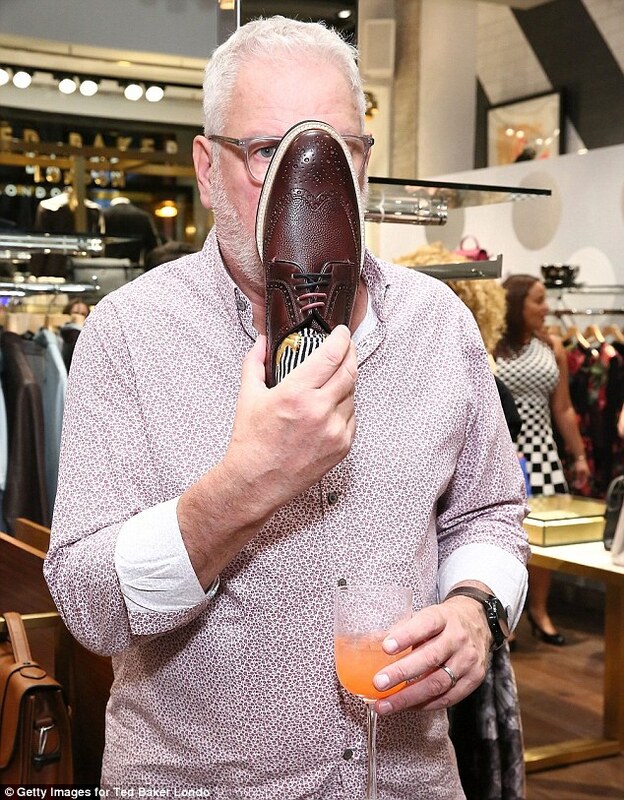 A statement today confirmed that Ted Baker has enlisted law firm Herbert Smith Freehills to independently investigate claims against Kelvin, which include allegations of ‘asking young female staff to sit on his knee, cuddle him or let him massage their ears’. Kelvin, who founded the fashion firm 30 years ago in Glasgow, has seen £50million wiped off the value of his 34 per cent stake in the business since the claims against him surfaced. Ted Baker has denied that hugging was ‘insisted upon’. The statement also revealed that group sales slipped 0.2 per cent in the last 16 weeks, driven by a decline at its wholesale division. The firm blamed unseasonal weather across the UK, Europe and east coast of America, as well as challenges in the retail market. Retail sales were buoyed by an 18 per cent leap at its online division. 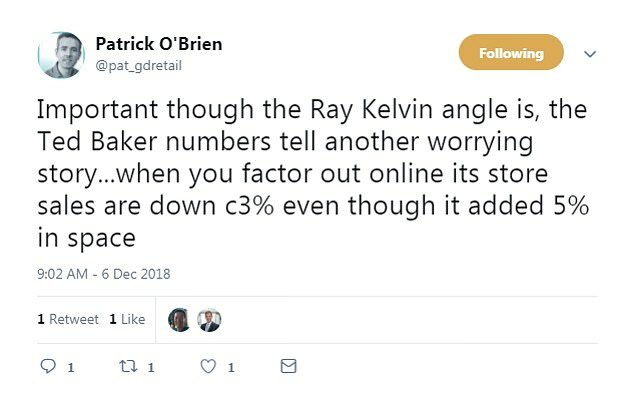 But, as Patrick O’Brien from GlobalData Retail pointed out, Ted Baker’s store sales were down by around 3 per cent for the period. 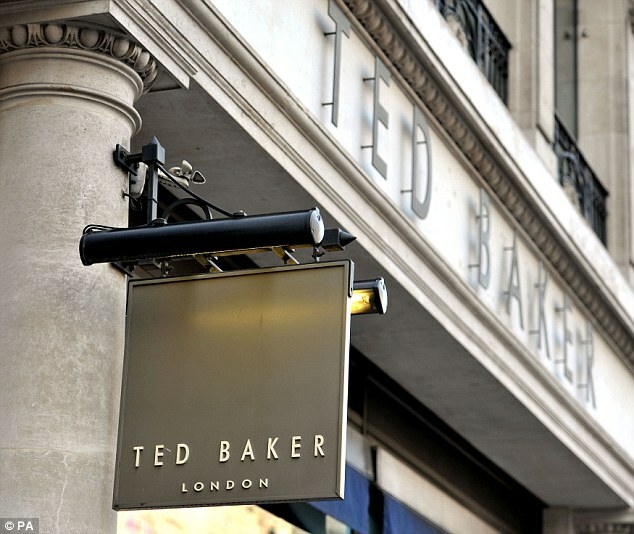 Ted Baker said its store sales in the most recent eight weeks rose 4 per cent as the weather became more typical for the season. Earlier this year, the retailer said it was stung by the collapse of House of Fraser as it posted lower half-year profits. Richard Hunter, head of markets at Interactive Investor, said that the sharp, 23 per cent decline in Ted baker’s share price this week to around £15.00 poses a number of questions, ‘not least of which is whether investors were waiting for an excuse to exit the stock’. He said: ‘Historically, Ted Baker was a swanky brand with an earnings valuation to match. The rerating of the stock has brought the multiple down to a level of just over 10 times earnings, as opposed to the 30 times figure the company previously attracted.